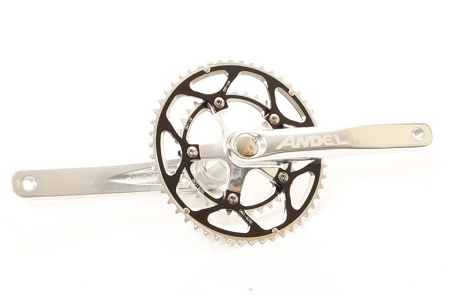 Andel Compact extra long crankset. These cranks use the Shimano hollowtech system so they work with standard Shimano style 24mm spindle bottom bracket systems. Chainrings and bottom bracket sold separately. 110bcd. Bottom bracket is a 24mm external bearing bottom bracket. Bottom brackets available to fit most modern bike brands including Trek, Cannondale, BB30, PF30, and more. Click here to see bottom bracket options. The Andel crankset is fine. I have put several hundred miles on it so far and have had no problems. The manufacturer aside, I am especially happy with proportional length crank arms. I purchased the 190 mm arms, and the extra torque is great. Climbing can now be done in a higher gear, and rides with rolling hills can be done faster. I can't see going back to 175 mm arms for anything other than recreational riding. Super quality, super stiff, excellent bottom bracket, chrome looks great on my bike. Length gives me power to stand and drive over climbs. Impressive power numbers on the trainer (hold 400watts on 10 min long climbs). Still trying to get used to the change in gearing. Really need close ratios as one shift makes a huge difference. I see these good for strength training and stretching out, but I cannot get a sprint going on them and struggle to hold wheels in motor pace sessions at 50km/h. Mainly because going a bigger gear takes a while to get back on top of it. Changes of speed are more difficult. Hard to stay smooth above 85rpm. On my fav climb I am doing 70rpm (3-6% climb @ 4km long) at >400 watts = above 20km/hr which is great for me. I am back to the shorter cranks for racing. These for strength sessions. 3 stars, the quality of the cranks and bearings are 5 star though. 1. weight 1.2kg with chainrings and bottom bracket (50/34T length 200mm). 2. Q-factor 168mm (double chainring). 3. Chain-line 43.5mm (double chainring).